WAM! Tag Team Title Match: Champions Ballz of Steele (DL Steele & JM Steele subbing for Brandon Steele) defeated the 2nd String team of Tommy Snow and The Ice-Man ... After the match Ice-Man turned on Snow and attacked him. >>> Sat., March 19: WAM! 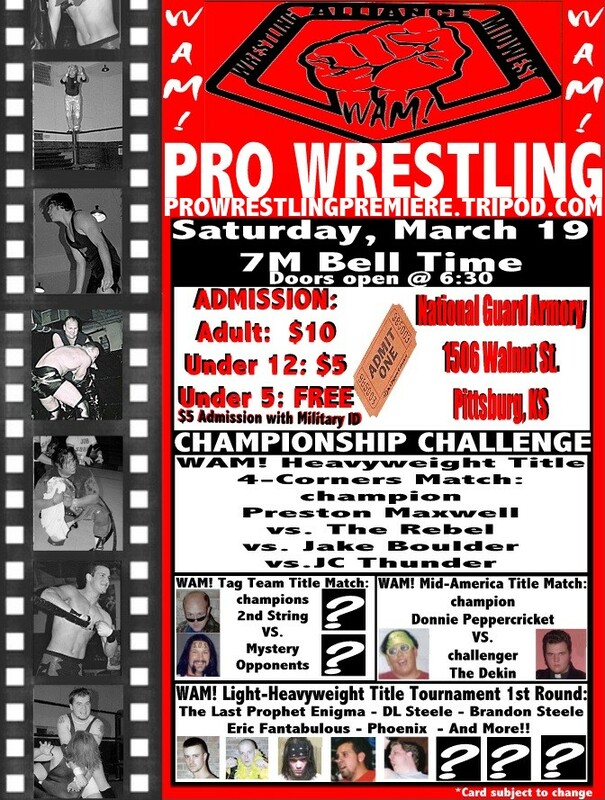 - "Championship Challenge"
>>> Sat., April 16 - "RETALIATION"
>>> Sat., February 5: WAM! 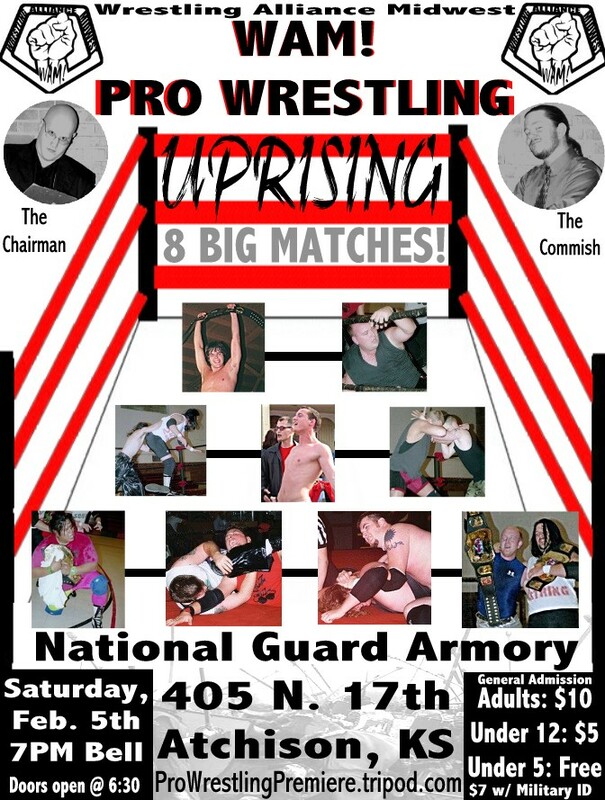 - "UPRISING"
Results: PM Money defeated Phoenix w/ Spookshow ... The Dekin w/ The Last Prophet Enigma defeated Jake Boulder ... Winner gets a spot on the WAM! Roster: "Tropical" Troy Roberts defeated Mr. Jones to become the newest regular member of the WAM! roster ... Ricky Reynolds defeated Eric Fantabulous (w/ Chairman Chatterbox Chad Phillips) ... After the match, Reynolds was inducted as the newest member of 2nd String ... WAM! Tag Team Title Match: Champions 2nd String (Ice-Man & Tommy Snow) defeated DL Steele & Job Goblin (subbing for the injured Brandon Steele) w/ Spookshow & Brandon Steele ... WAM! Mid-America Title Match: Champion Donnie Peppercricket defeated Blade w/ The New Testament (The Dekin & The Last Prophet Enigma) ... WAM! Light-Heavyweight Title Triple Threat Match: Before the match, Spookshow came to the ring to introduce PayDay when JC Thunder appeared instead, with a steel chair in-hand. PayDay never made it into the match. The match ended with no decision between Krow & Enigma, with Commissioner Blade Braxton declaring the WAM! Light-Heavyweight Title vacant ... The Rebel defeated Takeon the Korean Warrior ... WAM! 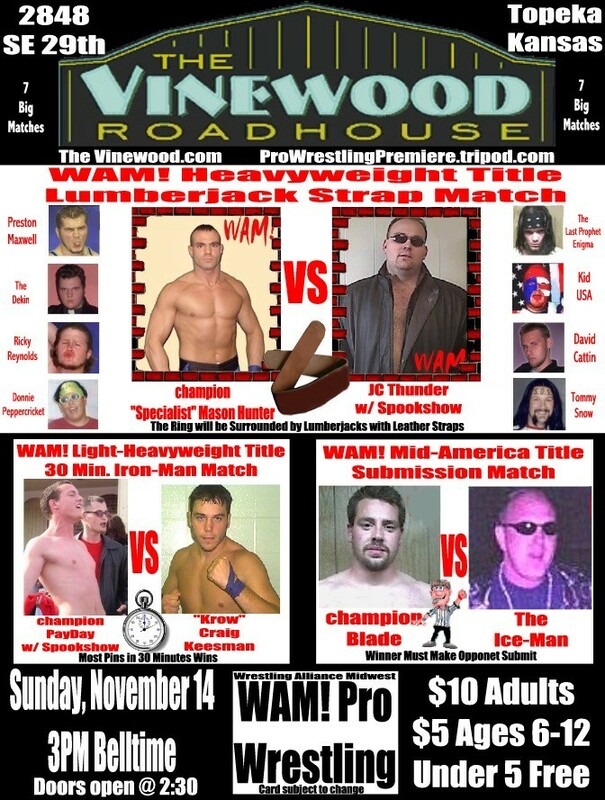 Heavyweight Title Match: Preston Maxwell w/ Chairman Chatterbox Chad Phillips defeated JC Thunder to become the new WAM! Heavyweight Champion after Spookshow interfered, hitting JC Thunder in the face with a massive fire-ball. >>> Sun., December 12: WAM! 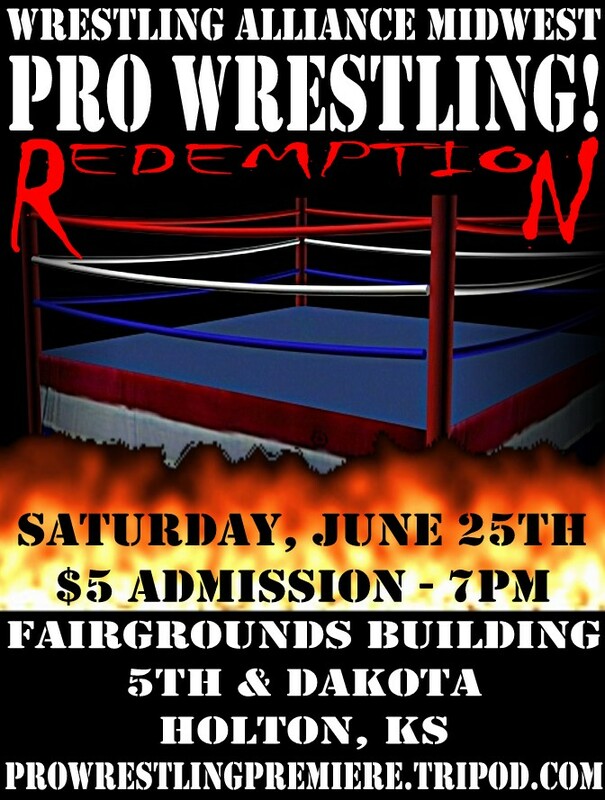 Results: Jake Boulder defeated Red Phoenix ... Special Attraction Handicap Match: 7'7", 450lb. Mighty Sequoia defeated Senor Chavez & Sancho the Crazed Lucador ... New WAM! Commissioner Blade Braxton, from WrestleCrap.com, is introduced and lays out Chairman Chatterbox Chad Phillips ... Ricky Reynolds defeated Preston Maxwell. Maxwell, winner of an online tournament for a title shot, announced he would challenge for the Heavyweight Title at the next WAM! event ... WAM! Light-Heavyweight Title Match: Champion "Krow" Craig Keesman defeated "Flashdance" Eric Summers ... PayDay Pionkowski w/ Spookshow defeated Kid USA by DQ after USA refused to break a hold ... WAM! 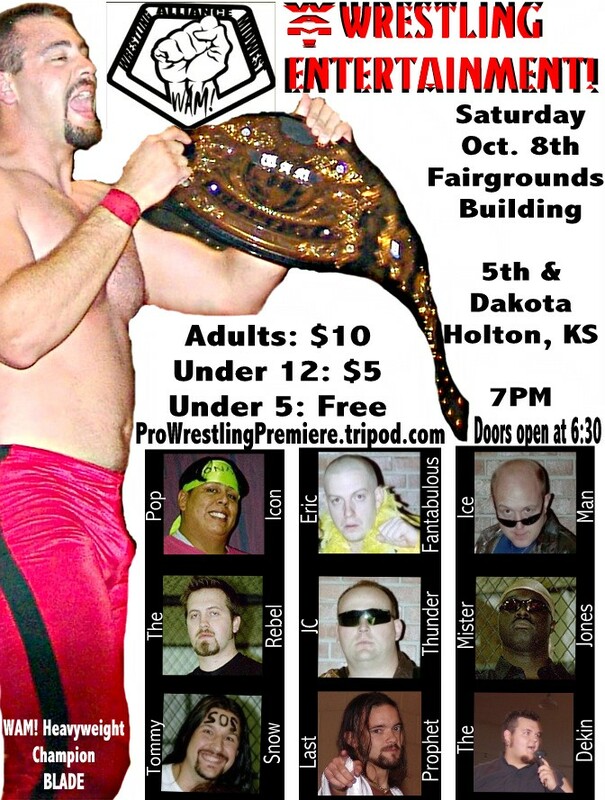 Mid-America Title Match" "Pop Icon" Donnie Peppercricket defeated Blade to become the new Mid-America Champion ... WAM! Tag Team Title Triple Threat Match: 2nd String (Ice-Man & Tommy Snow) defeated Ballz of Steele (Brandon & DL Steele w/ Spookshow) and current champs New Testament (The Dekin & Last Prophet Enigma) to become the new Tag Champs .... WAM! Heavyweight Title Match: The Rebel defeated champion JC Thunder by DQ after interference by Ballz of Steele. After the match, Spookshow along with Ballz of Steele and PayDay attacked JC Thunder. This brought out nearly the entire lockerroom, including a 7'7", 450lb. Mighty Santa Claus, who delivered a huge chokeslam to Spookshow to end the night. 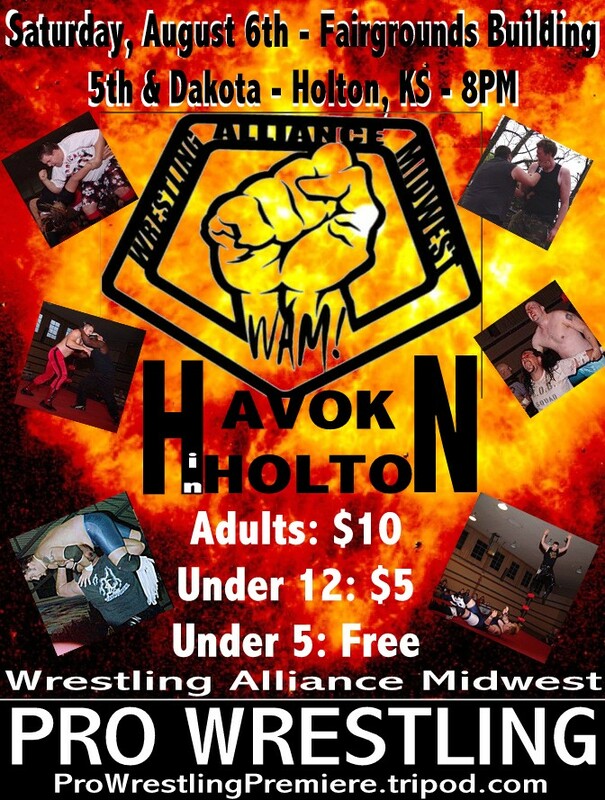 >>> Sun., November 14: WAM! 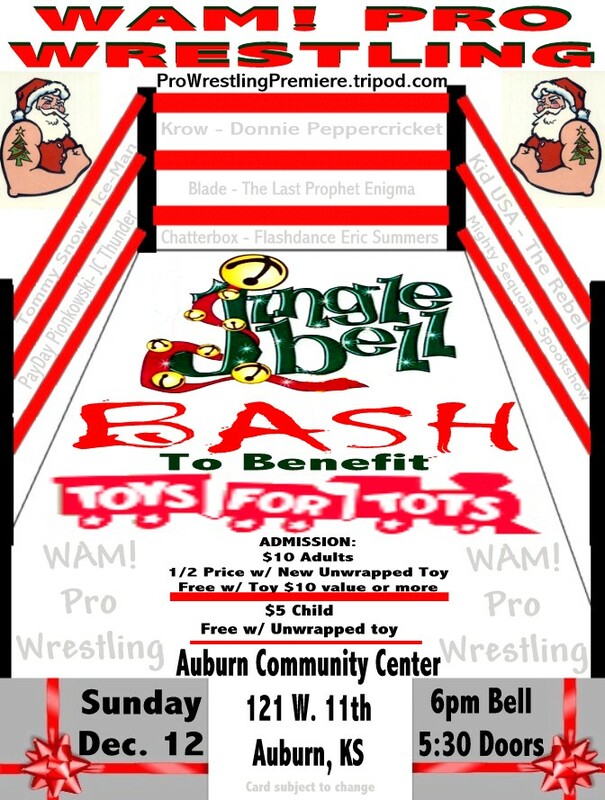 Results: Preston Maxwell won a 15 Man Battle Royal ... 2nd String (Ice-Man & Tommy Snow) defeated the SIN team of WAM! 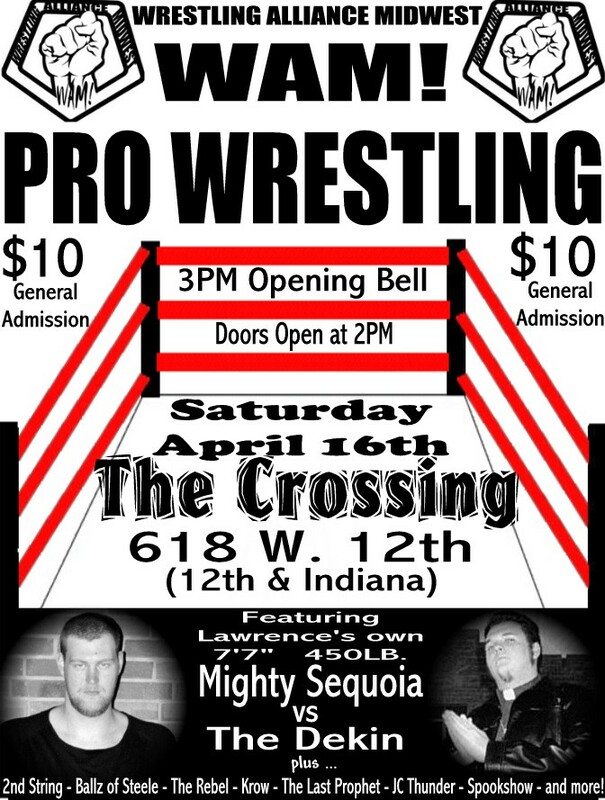 Mid-America Champion Blade & Brother Bash ... The Rebel pinned "Flashdance" Eric Summers ... Homeland Security (Killer Karl Kreuger & JM Steele) defeated Jayson Hawke & Bigg D w/ Baby Jay. After the match Chairman Chatterbox Chad Phillips fired Hawke & D ... Brandon Steele w/ Dr. Spookshow & DL Steele defeated his older brother Kid USA ... WAM! Light-Heavyweight Champion PayDay Pionkowski w/ Dr. Spookshow retained the title after new WAM! Sr. Official Tyler Cook DQ'd "Krow" Craig Keesman ... For control of the WAM! Tag Team Titles: The Last Prophet Enigma w/ The Dekin defeated "Smooth as Satin" David Cattin. After the match, Enigma announced that The Dekin would be his new partner in holding the tag titles, as the New Testament ... WAM! Heavyweight Title Match: Champion JC Thunder defeated PM Money. After the match, he was challenged by "Specialist" Mason Hunter, and a title match was sanctioned by Commissioner Rich Allen. Mason Hunter defeated JC Thunder to become the new WAM! Heavyweight champion ... Main Event Match: "Pop Icon" Donnie Peppercricket w/ Tommy Snow (representing 2nd String) defeated The Dekin w/ The Last Prophet Enigma (representing SIN). 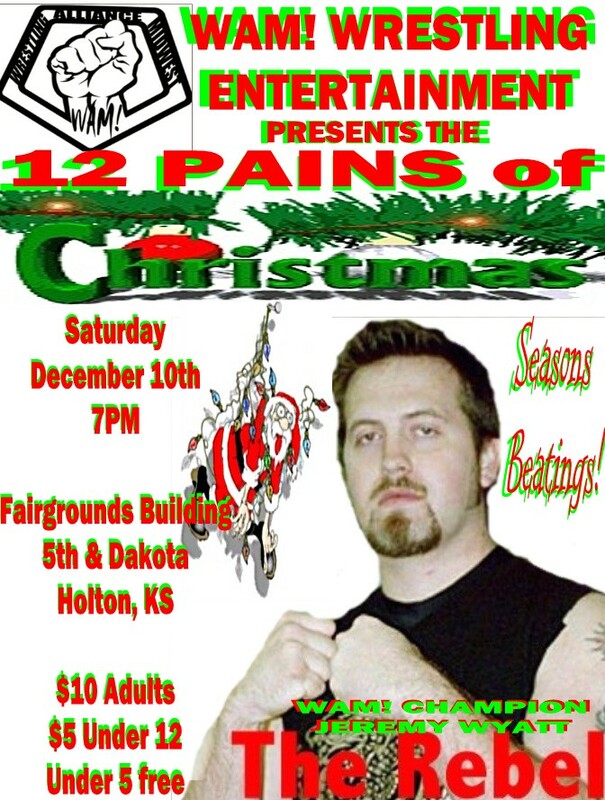 Location: Holton, KS - Holton Fairgrounds Bldg. Results: Donnie Peppercricket defeated Blasphemy ... The Rebel & Brad Estes defeated The Ballz of Steele (Brandon & DL Steele) ... WAM! Light-Heavyweight Title #1 Contenders match: Krow defeated Boogie Man w/ Dr. Spookshow. After the match, Strength In Numbers entered the ring and attacked Boogie Man (who was abandoned by his manager Spookshow) ... 1/2 of Elevation, the WAM! Tag Champions w/ partner Enigma, "Smooth as Satin" David Cattin defeated The Dekin ... WAM! Mid-America Title Match: Blade defeated "Specialist" Mason Hunter to become the new Mid-America champion ... No DQ No Time Limit Match: 1/2 of Elevation, the WAM! Tag Champions, Enigma, with partner David Cattin, defeated WAM! Light-Heavyweight Champion PayDay Pionkowski w/ Dr. Spookshow. The stipulations for the match were that if PayDay lost, Enigma would get three minutes with Spookshow and that if Enigma lost he must shave his head. After the match, Cattin shaved PayDay's head, while Enigma caught Spookshow. With his opportunity to get Spookshow in the ring, Enigma attacked his own partner, Cattin. This lead to SIN making their appearance, and introduced Enigma as The Last Prophet and the newest member of SIN. After attempting to interview the group, Ginger Gordon was then kidnapped out of the building into an awaiting vehichle; The Dekin issuing a challenge to "Pop Idol" Donnie Peppercricket, saying that there will be no false idols in WAM! - at the next WAM! 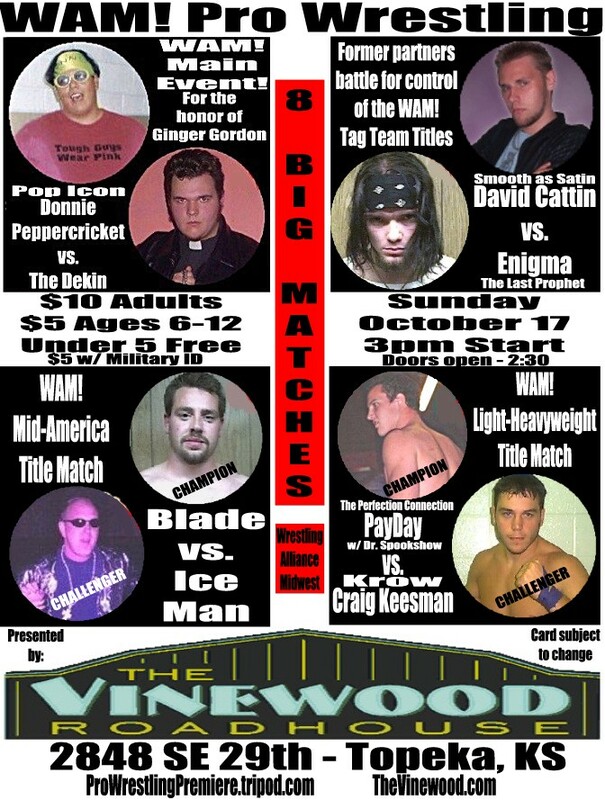 event they will have a match for Ginger Gordon's freedom ... Spookshow (still at ringside) is then joined by WAM! Commissioner Superstar Rich Allen who informs him that he will be in a match tonight and introduces the opponent, 7'6", 450lb. Mighty Sequoia. The giant attacks Spookshow, who is quickly saved by his associates PayDay and JC Thunder ... WAM! Heavyweight Title Steel Cage Match: Champion JC Thunder defeated Tommy Snow in a match that saw thumb-tacks, mace, and even a hired police officer used, among other weapons, against Snow. 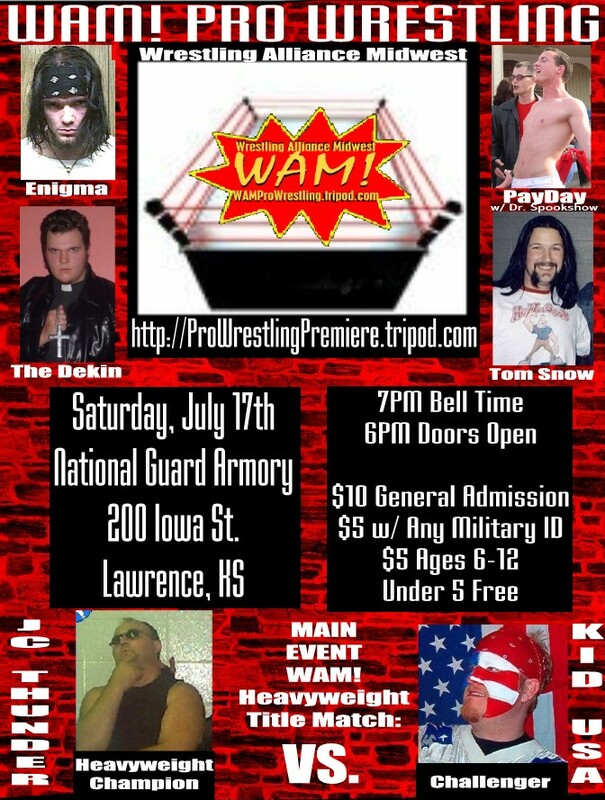 >>> July 17: WAM! "Up Close & Painful"
Results: Jayson Hawke defeated Blasphemy (w/ The Dekin). Tommy Snow came to ringside during the match and attacked The Dekin due to his constant interference ... After the match, Chairman Chatterbox Chad Phillips had Snow ejected from the building ... CCCP was joined in the ring by Ginger Gordon, who said that she had been sent with an announcement for CCCP from the other members of the WAM! Championship Committee: the name of the new Commissioner of the company, who would have complete control at live events. She then introduced Superstar Rich Allen; After saying hello to the crowd and and thanking his girlfriend, Lauri, for staying by him while he was ill, Allen's first order of business was to call out the Mighty Sequoia. Allen tried to convince the 7'6" monster that his manager Dr. Spookshow was using him for his own ends. This brought out Spookshow who commanded Sequoia to choke-slam the still recovering SSRA. Sequoia grabbed the new Commissioner, but dropped him and left for the back. Spookshow went after him and smacked him across the face for disobeying orders. For a minute it looked as if Spookshow was about to feel the big man's wrath, but instead Sequoia turned and left, followed quickly by his obviously shaken manager. WAM! Tag Team Titles #1 Contenders Match: 2nd String (Donnie Peppercricket & Bigg D) defeated the SIN - Strength In Numbers combination of The Dekin & Blade ... WAM! Light-Heavyweight Title Four Corners Match: Champion "The Perfection Connection" PayDay Pionkowski retained the title, out lasting Ice-Man and both members of the Ballz of Steele (Brandon & DL Steele) ... WAM! 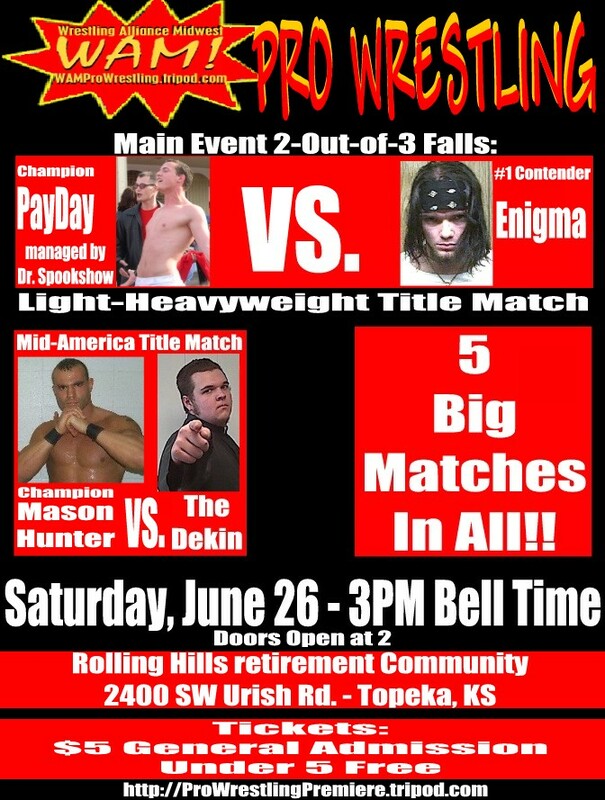 Mid-America Title Match: Champion "The Specialist" Mason Hunter defeated The Rebel. 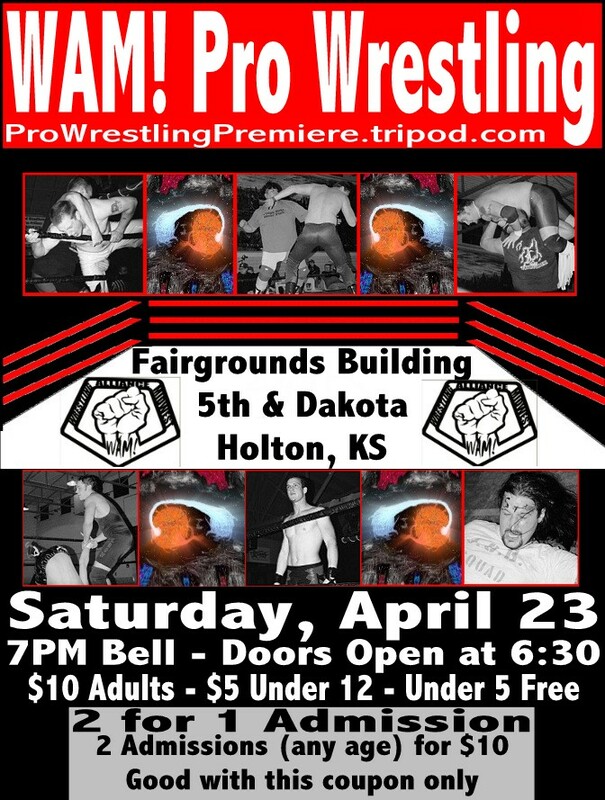 After the match Hunter was attacked by SIN, who left with the title belt after announcing that on August 21st in Holton, KS, a Last Prophet would reveal himself marking the coming of the end of days, and that they would start with Mason Hunter in their mission to cleanse all sinners before the end comes ... WAM! Tag Team Title Match: Elevation (David Cattin & Enigma) defeated the Cheap-N-Dirty team of Shane Lyes & Shinty McGinty to become the new WAM! Tag Team Champions. Following the match Enigma called out Payday and challenged him to a No DQ No Time Limit match on August 21st in Holton, if Enigma wins he will get three minutes in the ring with Spookshow, if Payday wins Enigma must shave his head bald ... Main Event WAM! Heavyweight Title Match: Before the match, champion JC Thunder w/ Dr. Spookshow, explained that he has not been beaten cleanly in over two years, listing several opponents, including "Hacksaw" Butch Reed, and even taking credit for putting SSRA in the hospital. The challenger, Kid USA, quickly pulled a school-boy roll up on the champion for the three count. SSRA, as the new Commissioner, then spoke up, stating that the match must restart since no bell had rung and the match had not officially started. In the end, Thunder got the victory by DQ when the Ballz of Steele ran in, knocked out the referee, and attacked Kid. When the ref started to get up, they faked an attack on Thunder and the referee disqualified Kid USA. After the match, Thunder & Spookshow were joined by PayDay, the members of SIN, and Chatterbox (with Tommy Snow's head "Nugget") to celebrate; tossing "Nugget" back and forth, until it landed in the hands of Blasphemy, who layed out the Champion and used the head to clear the ring. He then unmasked, revealing himself as Tommy Snow. Mason Hunter quickly came out and attcked Blade and the two battled to the back, while Snow was joined by Peppercricket, Bigg D, and Ice-man who chased out the Spookshow's crew and SIN. The four stood united in the ring, standing over an unconcious JC Thunder, and Snow then layed out CCCP. Superstar Rich Allen next announced that the first match that he would make as the new Commissioner would take place at the next WAM! 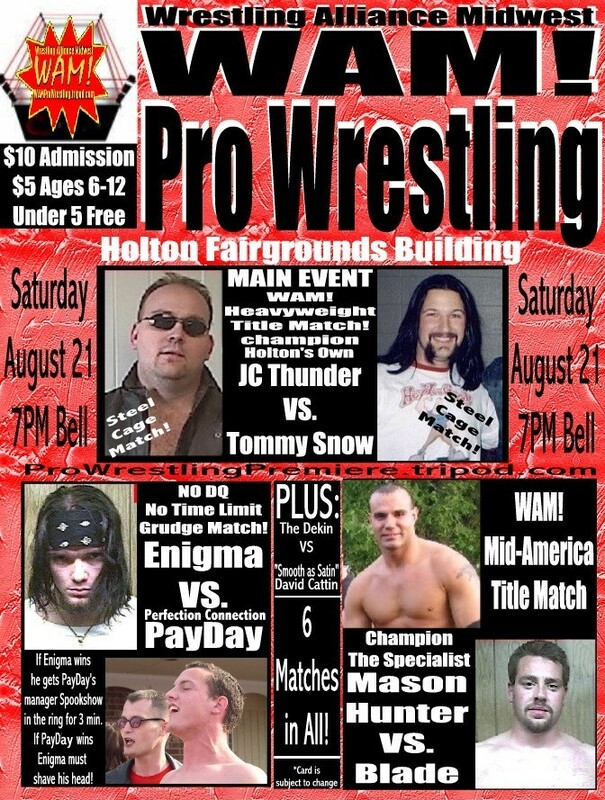 event, August 21st in Holton, and it would be JC Thunder versus Tommy Snow for the WAM! Heavyweight title. Location: Topeka, KS - Rolling Hills - 2400 Urish Rd. Results: The Iron Assasin beat Jayson Hawke with the Camel Clutch after Hawke passed out ... Blasphemy went over Bigg D after Lady Morgue and Dr. Spookshow turned on Bigg D and allied themselves with Blasphemy ... Red Phoenix vs. Genesis ended in No Decision after SIN (The Dekin, Blade, & Tommy Snow) attacked both men. After the brutal assault, The Dekin told both men that this was their initiation into SIN and both seemingly accepted the offer ... 7' 6" 450lb. Mighty Sequoia w/ Dr. Spookshow squashed PM Money & Gargoyle, pinning both men simultaneously with one finger each ... WAM! 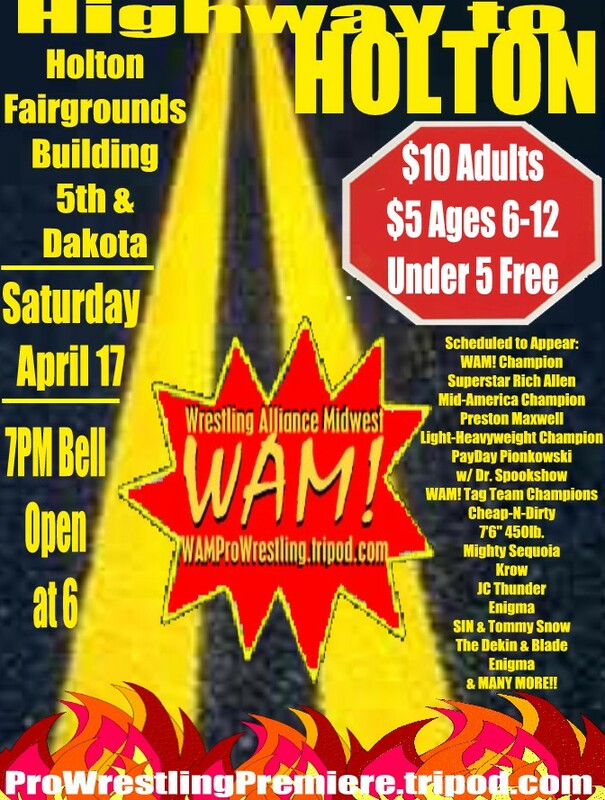 Mid-America Title Match: "Specialist" Mason Hunter defeated Cheap-N-Dirty member Preston Maxwell to become the new WAM! Mid-America champion ... WAM! Light-Heavyweight Title Match: Champion PayDay Pionkowski retained the title over former champion Enigma when the match came to a time limit draw. Before the match, WAM! Chairman "Chatterbox" Chad Phillips introduced his new Administrative Assistant, and welcomed former KPW Womens Champion Infinity to WAM!. Infinity attacked Spookshow and served her first night's duty in Enigma's corner durting the match ... WAM! Tag Team Title Match: Champions Cheap-N-Dirty defeated SIN (The Dekin & Blade w/ Red Phoenix), after pulling Phoenix into the ring and pinning him where the referee could not see his face ... WAM! Heavyweight Title Last-Man-Standing Match: JC Thunder w/ Dr. Spookshow & Lady Morgue defeated Superstar Rich Allen for the WAM! Heavyweight Championship after Allen was hit by "Chatterbox" , using brass knuckles, while he was attempting to hit Thunder as revenge for an assault earlier in the night. During the match, Allen dispatched both Spookshow & Morgue with a double noggin knocker, busting both open. >>> March 27th: WAM! 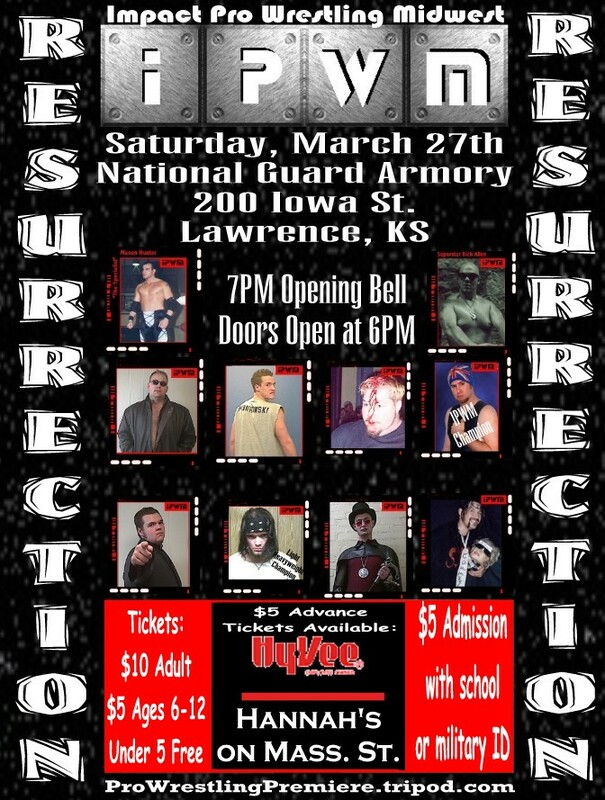 "RESURRECTION"
Location: Lawrence, KS - National Guard Armory - 200 Iowa St. Results: Bigg D (accompanied by Lady Morgue) vs. The Iceman ended in no decision when Superstar Rich Allen interrupted, requesting a shot a the WAM! Heavyweight champion Shane Lyes. WAM! Chairman "Chatterbox" Chad Phillips granted his request, only to be confronted by Lyes and his partners in Cheap-N-Dirty, demanding that a tag team from the faction be included in the night's Main Event and that C-N-D member Preston Maxwell be granted a match for the Mid-America title. Chatterbox agreed (WAM! Commissioner Tommy Snow quickly appointed himself guest referee for the Heavyweight title match) and announced the next match ... Jake Knox emerged in the Chairman's Challenge Battle Royal allowing him to choose a partner and enter the night's main event ... WAM! Light-Heavyweight Title Invitational: Champion Enigma defeated Red Phoenix ... UCW Cruiserweight champion "Smooth as Satin" David Cattin defeated Enigma after interference by Mighty Sequoia ... Sean Pehndragon defeated Cattin ... Krow defeated Pehndragon ... PayDay Pionkowski (w/ Dr. Spookshow) defeated Krow to become the WAM! Light-Heavyweight champion ... Chatterbox then called out Mighty Sequoia but was quickly interrupted by both Tommy Snow & Dr. Spookshow; Chatterbox then made a match between the two. Sequoia's alliegances became apparent when he turned on Snow during the match allowing Spookshow the win ... WAM! 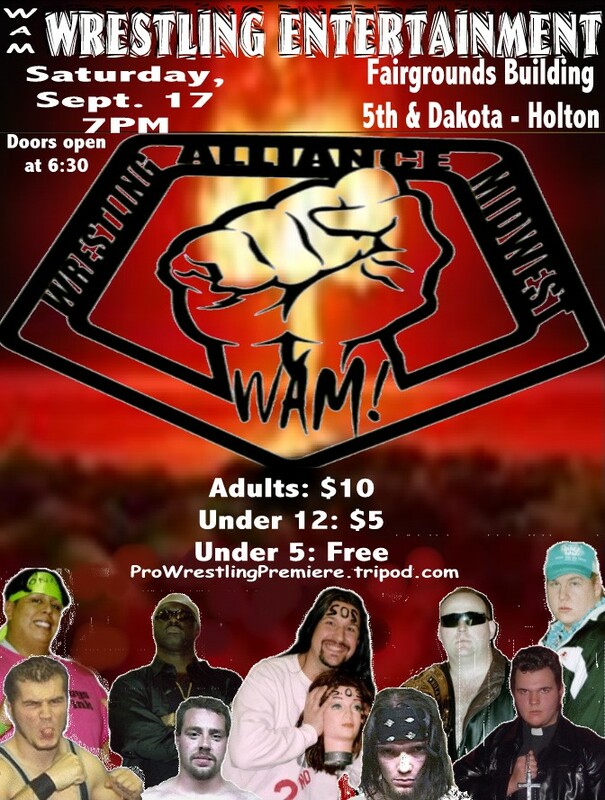 Mid-America Title Match: Before the match champion Derek Stone told the audience that he had a message for the WAM! Championship Committee: He was honored by being named Mid-America champion, but a new company meant a new title and he wanted to earn it and not be handed a title. Preston Maxwell defeated Stone after much assistance by Cheap-N-Dirty to become WAM! Mid-America champion ... WAM! Heavyweight Title Match: Superstar Rich Allen defeated Shane Lyes for the Heavyweight championship despite interference by C-N-D and referee Tommy Snow's refusal to count pin-falls and changing the match to no DQ and no count-out in Lyes' favor ... Kansas Grudge Match: "Wildcat" JC Thunder defeated Jayson Hawke ... Main Event WAM! Tag Team Title Fatal 4-Way Match: Griz & Joey Grunge eliminated the Knox Brothers ... Griz & Grunge eliminatedted SIN (Strength In Numbers), consisting of The Dekin & Blade whom was introduced as the newest SIN member ... Cheap-N-Dirty (Shane Lyes & Marty Trotter) defeated Griz & Grunge by DQ. Since the titles were vacat and a stipulation had been added that all titles must be filled, Cheap-N-Dirty were crowned WAM! Tag Team champions.